Everything you want in a relationship is waiting for you. Waiting for you to be ready. Waiting for you to heal past wounds. Waiting for you to tell the truth about your experiences. Waiting for you to muster the courage to become compassionately curious about where and when you abandoned yourself for the possibility of love. Waiting for you to learn the lessons your teachers were there to teach you and break the patterns in love. Waiting for you to shed the beliefs that have been unintentionally holding you back. 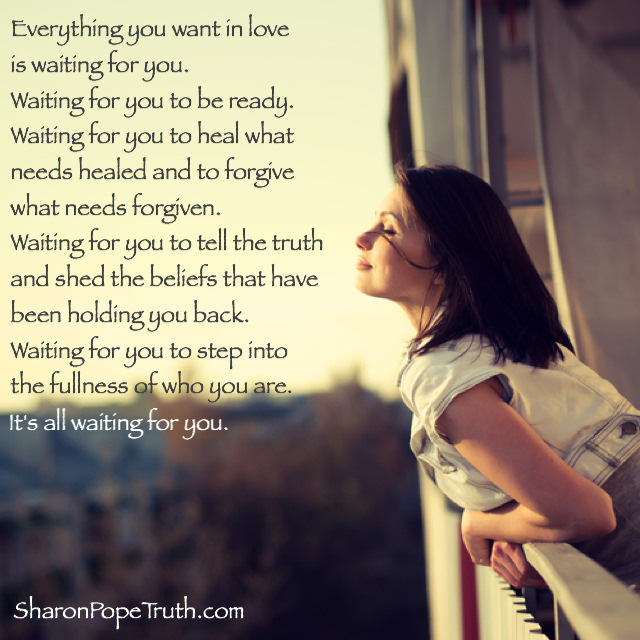 Waiting for you to step into the fullness of who you are – owning the good and the bad; the messy and the magnificent. All of it. Waiting for you to become the person you will need to become for that love to find its way to you. You see, everything you want to create in the coming year is waiting for you to realize that your experience in love happens through you, rather than to you. And what it is that you want to attract, receive and sustain, just asks that you meet it halfway. Become the type of person you so want to attract into your life. Say “yes” to doing something you’ve never done in order to have something you’ve never had before.